The General Bill of Sale is a document that works as a receipt for any type of personal property is exchanged for trade or cash. The form is needed more by the new owner if they ever should be forced to prove ownership, or at the very least, list who sold them the item. The paper contract is considered a valid legal and binding document upon the signature of each party and after the trade has been completed. 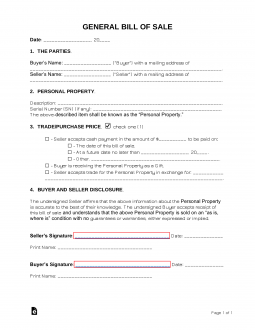 The buyer should understand that with this document they are buying the personal property item in “as-is” condition. Why Use a Generic Bill of Sale? A Generic Bill of Sale form is used as a receipt that describes all the details of the transaction between a buyer and a seller. It serves as proof of ownership and holds both parties (the buyer and the seller) accountable to the agreed terms listed in the bill of sale. This document will have everything from the buyer and seller’s information, a description of the item up for sale, the date of the sale, any other terms or warranties, and finally signatures from the buyer, seller, and any witnesses. What Kind of Transactions Requires a Generic Bill of Sale? Make sure to check with your state laws and see if a specific bill of sale may be needed for your sale. If there is none specified, then feel free to use our Generic Bill of Sale form. It includes most of the same information in other bill of sale documents and can be used to help document your transaction.